Production and release of endorphins (these are morphine like substances produced by various cells in the body that inhibit the sensation of pain). The short-term effect is significant in 5 to 10 % of cases during or after the conclusion of the initial treatment, but is not as important as the long term or cumulative effect. The immune response is stimulated. Higher outputs of specific enzymes, greater oxygen and food particle loads for blood cells and a more effective immune system are induced by laser light. Lymphatic drainage is improved. Laser light activates lymph vessels to allow the affected tissue to drain interstitial fluids, reducing the inflammatory process. Laser light reduces swelling caused by bruising or inflammation of joints to give improved joint mobility. Slow recovery of nerve function in damaged tissue can result in "dead" limbs or numb areas. 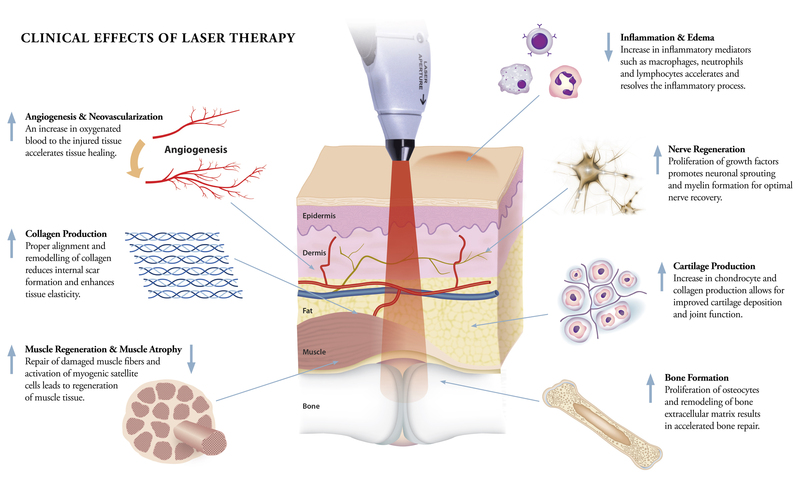 Laser light will speed the process of nerve cell reconnection to bring the numb areas back to life. Laser light also increases the amplitude of action potentials to optimize muscle action. Production of growth hormones is increased. Laser light accelerates cellular reproduction and growth. Stimulation of the healing process is accompanied by relief symptoms. It should be noted that many other positive physiological activities are modulated and extensive research is currently in progress to fully explore these changes.